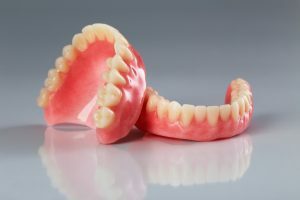 Our blog topic of the week is dentures and we are here to provide a comprehensive guide to the huge improvements that can be achieved with dentures. Many adults will live for years or even decades without even considering visiting a dental office to have a replacement made for their missing teeth. We are here today to dispel some common myths that may exist surrounding dentures. We would also like to offer some solutions to adults who need to have their first set of dentures made or who are unhappy with their current set of dentures. According to the American Academy of Prosthodontists, the number of Americans with no teeth at all is approaching 40 million and this number is expected to increase in the next twenty years. At Pelican Landing Dental, we are dedicated to our patients and one of our primary goals as dental providers is to provide pertinent patient education. One way that we teach our patients about some of the most important oral health topics is with our blog. We want to ensure our patients that missing teeth is nothing to be ashamed of. We are here to help in any way that we can and we want to show you the huge change that dentures can make in your life. If you are interested in having dentures made for you or for a family member, please do not hesitate to contact us at any time electronically or call (239)449-6104 to schedule a consultation.We are always accepting new patients from the Estero and Bonita Springs areas and surrounding communities. There are many reasons that people lose their teeth throughout their lifetime. Most commonly, inadequate oral hygiene combined with lack of regular dental visits contributes the most to people losing their teeth. Many people are afraid to visit a dental office until it is too late to save their teeth. Consequently, the dentist must extract all of their remaining teeth due to disease. There are two diseases that lead to the eventual lose of teeth: caries and periodontal disease. Interestingly, these are the two most common dental diseases. Caries, also know as cavities, is dental decay, which leads to the eventual breakdown of tooth structure. Periodontal disease, also know as gum disease, leads to destruction of the gums and bone that support the teeth. When people have periodontal disease, their teeth slowly become loose until they fall out. If you have teeth remaining and think that you may have caries or periodontal disease, it is important to schedule a dental consultation so that your disease process can be halted and you may have the opportunity to save some of your teeth. How Can Dentures Improve Your Quality of Life? There are many ways that dentures can improve your quality of life—some are more obvious than others may be. The primary reason that many people want to replace their missing teeth is because of esthetics, or appearance. Most people who do not have teeth are uncomfortable with the look of their “gummy smile”. Additionally, missing teeth can cause facial muscles to sag, which can make people appear older than they actually are. Dentures can help you look younger by filling out your face and profile. Additionally, dentures can improve your health by improving your nutrition. With dentures, you may be able to eat more nutrient-dense foods more easily. Additionally, dentures may improve your speaking abilities. Certain words and sounds can only be made when the lips or tongue contact the teeth which makes speech difficult without teeth or dentures. Please watch the following video from the American Dental Association for more information on Living with Dentures. What Are The Different Types of Dentures that Can Be Made? Complete Dentures are the conventional type of dentures that people think of when they think of dentures. A pink acrylic base is used to replicate the gums and hold the dentures to the top and bottom jaws. Plastic teeth are placed into this plastic to replicate the look and feel of natural teeth. When you have your dentures made, your dentist will work with you to ensure that the teeth look as natural as possible. Immediate dentures are very similar to complete dentures. Complete dentures are made after a patient has had all of their teeth extracted and their mouth has been given time to heal properly. Immediate dentures are inserted into the mouth right after extractions are done and are used as a “band-aid” while the gums heal. They also ensure that you do not have to spend any time without teeth. Some people are unhappy with the fit and feel of dentures and complain that they slip and slide while eating, drinking, speaking, or smiling. Overdentures are a good solution because they improve the retention of your dentures. You dentist will place implants on your top and bottom jaws. Connectors will then be built into your dentures so that your dentures can be snapped onto your implants. Your overdentures will still be removed at night but they will stay locked into place more easily than conventional or immediate dentures. Some people may be unsatisfied with dentures that have to be removed at night and are looking for a more fixed solution. Hybrid dentures are connected to implants, made out of dental porcelain, and can only be removed by your dental professional. Hybrid dentures are removed periodically for regular cleanings to maintain the health of your implants and your gums. As you can see, there are many different options available for replacing missing teeth and patients are happy with a variety of treatment options. If you are considering dentures of any type or have any unanswered questions, please feel free to contact us at any time electronically or call (239)449-6104.